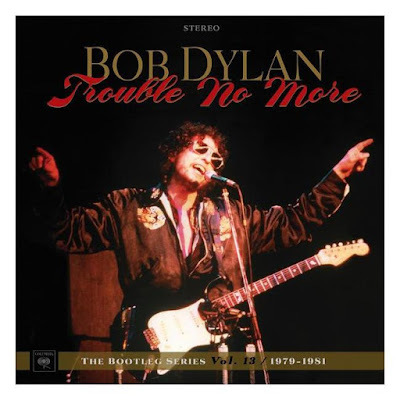 The latest installment - Volume 13 - of Bob Dylan’s official Bootleg Series titled, Trouble No More was released last week as a deluxe 9-disc box set via Columbia Records/Legacy Recordings. Trouble No More compiles Dylan’s highly-controversial conversion to Christianity and the resulting bluesy, Gospel-drenched music he wrote, recorded and performed during the years 1979 to 1981. Dylan was equally spiritually-inspired and very prolific during this time, releasing three Christian-themed albums, 1979’s Slow Train Coming – featuring the Grammy Award winning “Gotta Serve Somebody” – and 1980’s Saved and Shot Of Love. The comprehensive Deluxe Edition of Trouble No More spans 8 CDs and 1 DVD and premieres 100 previously unreleased live and studio recordings, including 14 never-before-released songs. Of the 8 CDs; two discs feature a full live performance from Toronto in 1980 and two that capture a striking performance recorded July 27, 1981 at Earl’s Court in London that also features hits and favorites from his past catalog. Also included are two more discs of tour highlights from other performances of the era. These six live discs are the crown jewel of the entire box set as they feature much livelier versions of the songs with his band and Gospel choir locked in tight. Rounding out the collection are two discs full of outtakes and rarities including soundcheck rehearsals highlighted by the previously unreleased track “Making A Liar Out Of Me”, which was recorded during rehearsal on September, 26, 1980, heard below. The bonus DVD features a new full-length film titled, “Trouble No More: A Musical Film” that combines never-before-seen footage from his 1980 tours with newly-filmed scenes of actor Michael Shannon as a preacher delivering fiery sermons that were written by writer and critic Luc Sante. Also included in the beautifully-packaged set is a 120-page hardcover photo book loaded with tons of rare photos and memorabilia from the era as well as engaging essays from Penn Jillette (of Penn & Teller) and acclaimed author and music journalist Amanda Petrusich, as well as an intriguing extensive track-by-track commentary. A must have for every Bob Dylan collector! Trouble No More is also available as a 2-CD sampler set and a 4-LP set on 180 gram vinyl with each set featuring 30 highlights from the deluxe edition.